Jan, a long-time resident of Fairfax County, first launched her fashion career with trunk shows. Having a keen eye (and a growing fanbase) for her ability to find clothing that fits, wears, and functions well, she opened The Jeans Whisperer in 2011. Click here to get directions to the store or schedule a personal fitting with Jan. The Jeans Whisperer offers women a flattering selection of intelligently versatile, fun to wear, and fairly priced clothing from size 0 to 18. We carry an ever-expanding selection of denim brands—including Silver brand, Grace in LA, Level 99, Miss Me and NYDJ—as well as a unique selection of dresses, tops, jackets, and accessories from a variety of local and national designers. 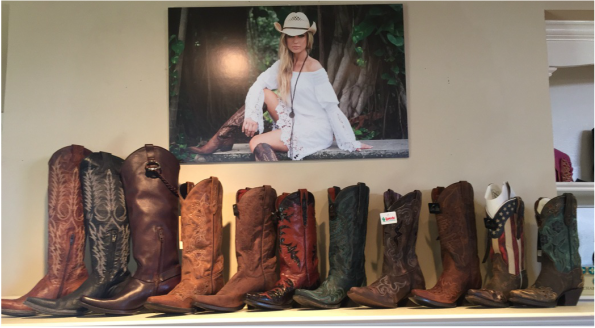 Our boots and shoes collections represent Laredo, Dan Post, Old Gringo, and Charleston Shoe Company. Originally located in historic Leesburg, we moved in October 2018 to One Loudoun, making your next favorite pair of jeans, top, or dress that much easier to find. We even host the occasional on-site event so you never have to travel very far to look your best. For the latest events, fashion tips, and lookbooks, check out our blog here. Want more? Follow us on Facebook and Instagram for the latest news, styles, and specials!